Con Houlihan, the great Irish sports writer from my hometown of Castleisland, once replied to a young poet who had shared his writing, “Keep going. You’re making all the right mistakes.” As a young boy, the words did not fully resonate with me, but now—a bit older and hopefully wiser—I can see the wisdom therein and how it relates to our work with 400G. 400G Ethernet is extremely demanding on technology. It is not just the immense pace of data going from IC to module to network and beyond, it is the challenge of getting all of this to happen in a robust and compact way that can scale beyond a research lab in San Jose to production and manufacturing across the globe. Novel technology like PAM-4 signaling means we always have a few errors on each link. While the FEC takes care of that, do we really know how good the link is and how much margin we’ve got? Furthermore, the FEC is not a magic box that can make all errors go away. It has certain limitations and characteristics which make it wise to know the nature of those errors and to see trends and underlying causes. This insight into causes is the key to delivering a robust 400G. Just because something works once in the lab doesn’t mean the 10,000 you will build and deploy each month will work trouble-free. When the FEC type was chosen for 400G Ethernet the wise old heads at IEEE worked to find the right balance by looking at the types of errors that can occur in transmitting data across electrical and optical links, tolerable delays, and other FEC impacts such as power and cost. Of course, in the real world other error sources can creep in and cause errors with a different ‘fingerprint’ from the normal ‘FEC optimized’ channel. These can lead to uncorrectable errors and poor system performance – it is only with the deep insight of the real nature of the errors that we can fix those and make “all the right mistakes” in our 400G link! 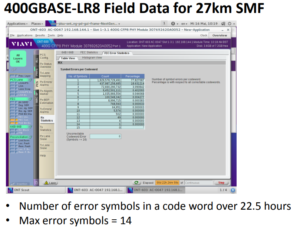 More details (like the slide excerpt at right) can be seen in this “400GBASE-LR8 Measurement Data for Reaches >10km” at the public IEEE site. With FTTH/PON… Are You Working Smart?